Children love learning and there are some things that they have to learn as they grow up, whether it’s learning to read, ride a bike, swim, or so much more. However, children also get sick sometimes and aren’t happy that a cough or cold prevents them from doing what they enjoy. 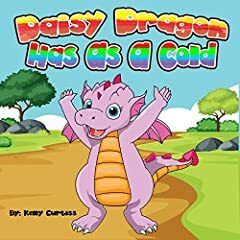 Baby Dragon Has A Cold is a wonderful bedtime story for young children, in which they learn how even animals sometimes become ill and have to wait until they get better before they can have fun again. This rhyming story is accompanied by delightful color illustrations throughout the book that are sure to thrill young readers. Baby Dragon is learning how to shoot fire with his father and older brother, until a cold spoils his plans. Children will identify with Baby Dragon as he learns that he has to take time away from favorite activities, so that he is well enough again to practice what he needs to master in order to grow up. Parents and teachers can also employ Baby Dragon Has A Cold to teach children about the need to look after their bodies, so that they can do the things that they enjoy and become healthy adults. This is a book for bedtime reading with younger children, but older children will also enjoy reading Baby Dragon Has A Cold on their own.